Like most people, I often wonder how long I'll be remembered after I die. One Day, You're Going to Die. Part of me wants to save some aspect of myself & the life I've led. That's why I do things that might preserve my identity. I create art, save photos, engage on social media, and write on this blog- all to leave some kind of lasting imprint of my physical presence. Who knows how long websites such as Facebook or Google will last, but perhaps by leaving these digital artifacts, they will be archived in whatever format the Internet takes in the future. There are now websites, like Networked Mortality, that help us to prioritize the information and aspects of our life that we want to continue on, after we depart this physical world. One day, I'd also like to have children, to continue the legacy of genetic information that has been passed on to me since the very beginning of Life on this planet. On the other hand, my contemplations on the philosophies of Buddhism, Taoism, & the Greek philosopher Heraclitus have made me aware of the folly of such endeavors. Impermanence & change are inevitable, and I've tried to cultivate non-attachment to the things of this world. I think ahead 10,000, or 100,000, or a million+ years into the future, and it's hard to conceive that any remnant of my existence will survive. It's even questionable whether any trace of the human race itself will remain. However, it is in our nature to survive, and that means we are compelled to try to preserve some part of ourselves for as long as possible. 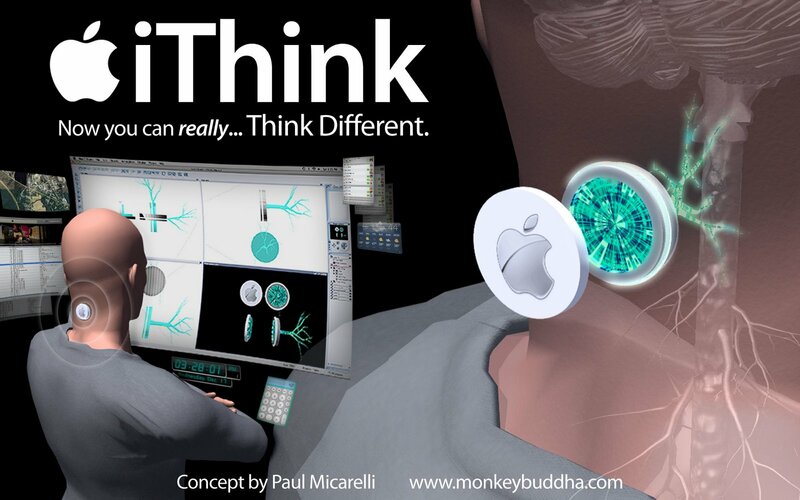 As technology advances and we find ways to model the human brain more accurately, it is possible we may eventually be able to preserve the individual mind. 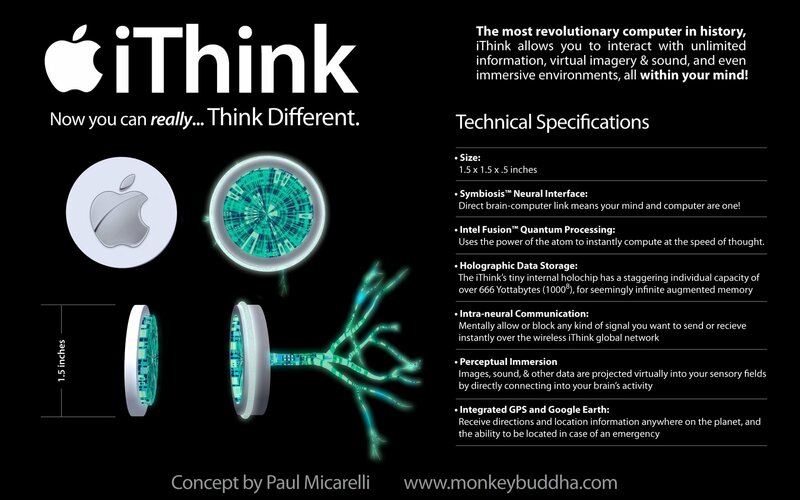 Will such a back-up system be simply a recorded copy of our brain's mental accumulations, or would it be a complete & aware consciousness that's embedded in a new medium? 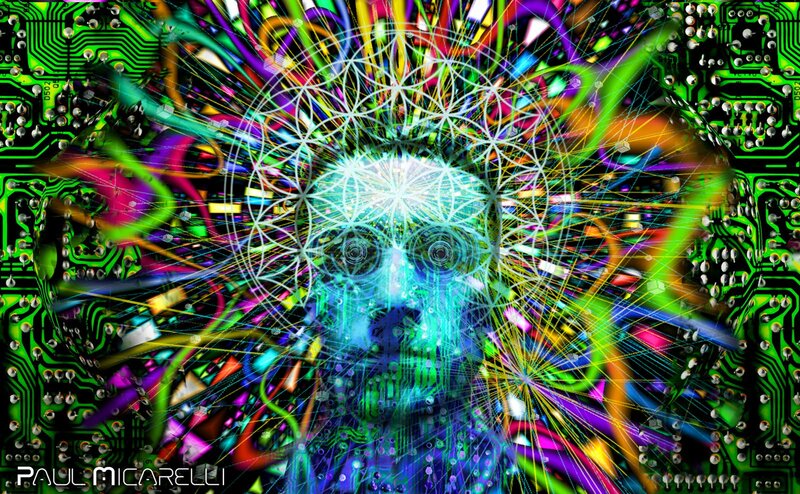 Consciousness is complex & malleable. Right now, being "conscious" includes not only our mental activity, but also our physical sensations & emotional states. As our consciousness becomes augmented by electronic devices & digital media, there's no limit to the states of mind that could be experienced. Perhaps we could even gain extra senses or enhanced perceptions, such as people who've embedded magnets in their skin and can detect electromagnetic fields. I try not to be too concerned with what will happen when I die, or if there's some way to cheat death through artificial means. I simply live my life to the fullest each day. When it's time for my body and mind to transmute back into the infinity of the Universe, I will hopefully feel satisfied that I made the most of it, while I was here. One of Jason Silva's brief, but brilliant, "Shots of Awe" videos. No matter how advanced technology become, I think people of older generations will always feel nostalgia for the culture & tech of their youth. 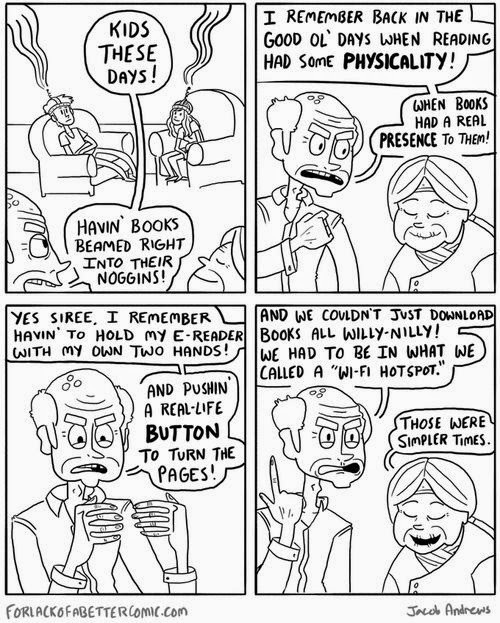 This comic I saw on fUSION Anomalog captures the idea perfectly, as old people watching kids use brain-interfacing devices reminisce about "simpler times," with e-books, touchscreens, & wi-fi. I have been a lifelong fan of the Star Wars saga. I'm eagerly anticipating Episode VII being released this year. We'll see whether Disney rejecting George Lucas's involvement turns out to be a good move, but considering their handling of Marvel properties, it looks promising. Despite the hate for the prequels, the existing 6 movies are timeless works of art that are an inescapable part of our cultural legacy. 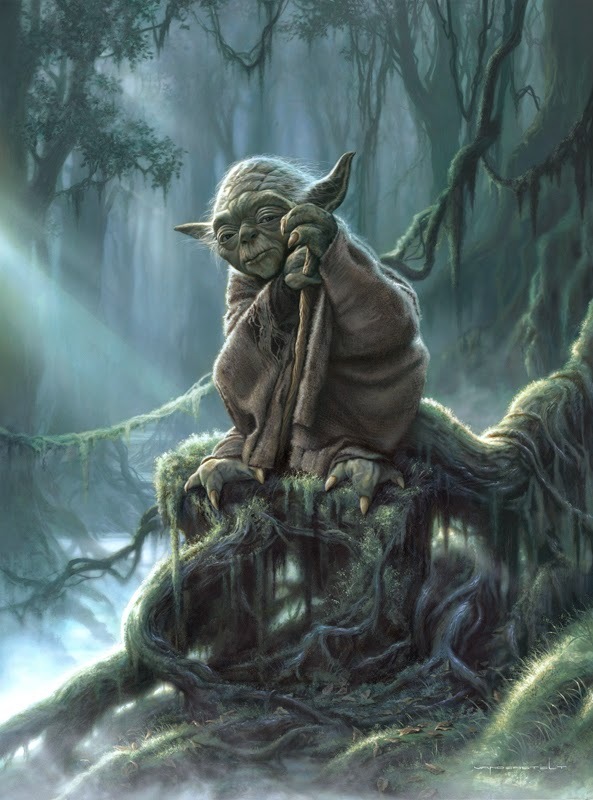 I recently discovered amazing paintings of the Star Wars characters by Vanderstelt Studio. 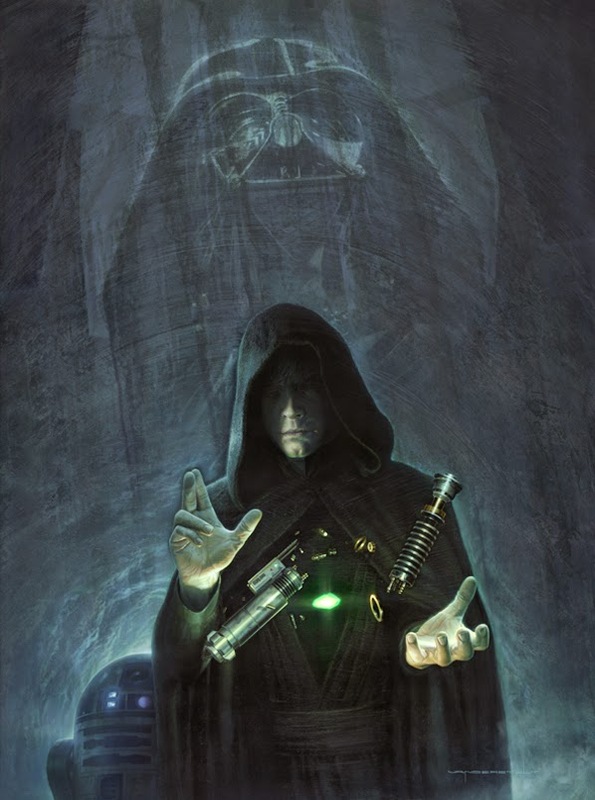 to create a new lightsaber with green blade. 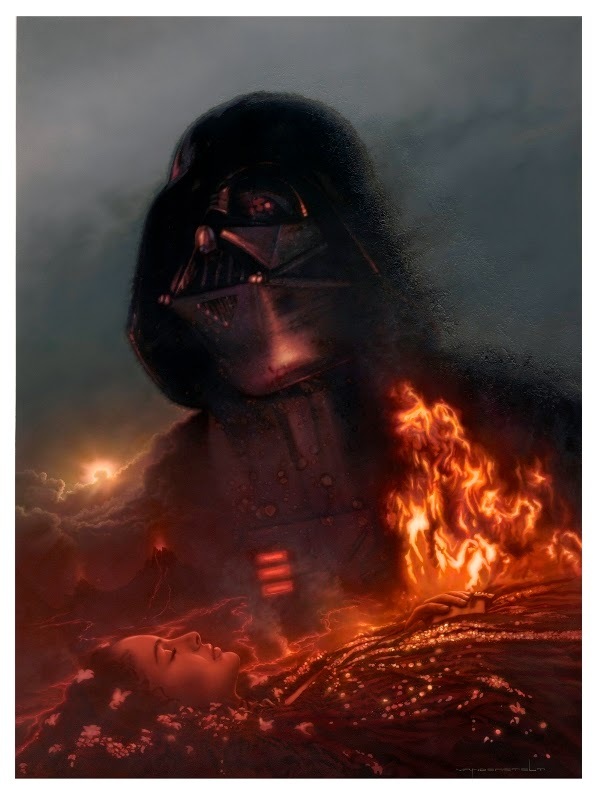 and the physical scars from his immolation on Mustafar. I came across another image-in-motion that shows the same process in a more photorealistic way, from the point of view of the animals changing over the eons. I played Crysis 2 about a year ago, but now realize that I never wrote a game review for it. Having finished Crysis 3 recently, I feel that this review can apply to either game. Crysis is a first-person shooter (FPS), in which you are in control of a piece of wearable futuristic technology called a nanosuit. The nanosuit enables the player to have innate abilites, such as heads-up display, super strength & greater jumping ability. The suit also has two enhanced functions that you can activate at any time - 'Cloak' & 'Armor'. You can either turn invisible for stealth tactics using Cloak, or fortify your nanosuit in the heat of battle with Armor. These are powerful features that seem vital once you get used to using them throughout the game. Unfortunately, my biggest pet peeve with the Crysis games is the synthetic voice that says "Cloak Engaged!" or "Maximum Armor!" every damn time you activate these functions. I don't know why it annoys me so bad, but it does, and actually took away from my enjoyment of the game. Anyway, the game, overall, is fun to play. It takes place in a ruined New York City, after an alien invasion by a species called the Ceph. These creatures operate using a hive mind connection. They are controlled through a main intelligence, called the Alpha Ceph. They have millions of years of communal intelligence among them & have developed technologies that humans cannot even comprehend. It turns out that the Ceph invasion from Crysis 2 was just an advance force for an incursion from a much larger alien army. The massive Ceph swarm is preparing to come from the other side of the galaxy through an Einstein-Rosen bridge- a dimensional portal allowing instantaneous interstellar travel. NYC is the epicenter of this larger invasion, but has already been destroyed from the events of the previous game. The city's ruins have become partially wilderness, covered in trees, plants, & water, which makes for an interesting setting. There are some stages that take place inside buildings or underground as you seek out the Alpha Ceph, but I felt that the literal urban jungle environments were the most fun to play through. The controls & game mechanics are pretty straightforward for an FPS. There are a decent variety of guns & weapons, but I found myself mostly sticking to the same ones. 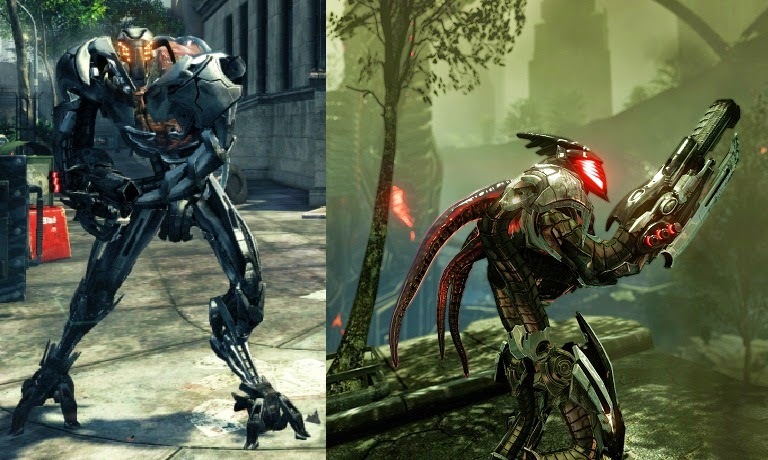 The nanosuit powers, such as cloaking & armor, still make the combat more interesting, but I don't feel like Crysis 3 offered any substantial improvement from the second game. There wasn't too much in this one that really "WOW!-ed" me from a gameplay standpoint. Even the final battle against the Alpha Ceph felt like a fairly standard boss battle, even though it was an intense encounter. The story is a good one, with the dual themes of man merging with technology & the possible consequences of encountering a hostile alien race. These two themes are integrated when it's discovered that alien technology used to make the nanosuit is allowing your character, Prophet, to become directly connected to the Ceph. Despite the strong story elements, I never really felt immersed within the game, like I have with titles such as the Assassin's Creed series. I'm playing AC: Black Flag now & it's much more engaging on all levels than the Crysis games. For some reason, I find myself liking 3rd-person games, where you can see the character. Even Far Cry 3, though, (another FPS game) was much more immersive than Crysis. Maybe it'll be more fun if ever I go back and play some levels on a harder difficulty, but it's rare for me to go back & play games I've finished. My gaming time is limited, so I feel like I usually want to get right to the next title in the lineup. 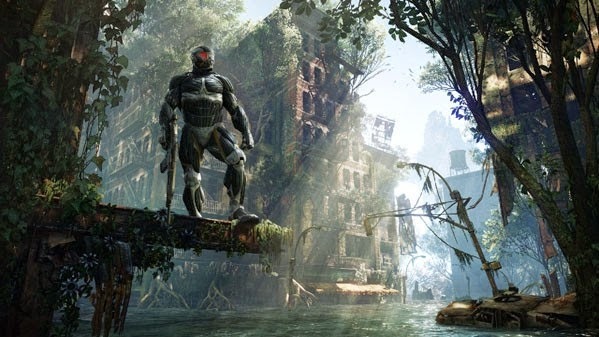 All-in-all, Crysis 3 is not a bad game. I just don't think it was as engaging as it could have been. I can't pinpoint exactly why I felt a disconnect with the gameplay, but it definitely did not feel like it lived up to its potential. I'd recommend it if you like FPS-style games, just don't expect to be blown away by the experience. As a graphic artist, one of the most difficult challenges is coming up with original designs. The phrase "There's nothing new under the sun" sometimes feels all too true. You may think you have an original approach to a design, but with some research you may also find that something very similar has already been done. On the other hand, graphic design is often a synthesis of existing concepts & elements, so it's good to be familiar with common approaches & conventions to dealing with design problems. I saw this page on the Internet Archive that demonstrates some common looks and treatments of logos in corporate branding. This is a guide on what to avoid when designing a logo, but it could also help with using elements that could be applied to more unique approaches. This is a funny example of a wordfind puzzle that I saw on fUSION Anomalog. 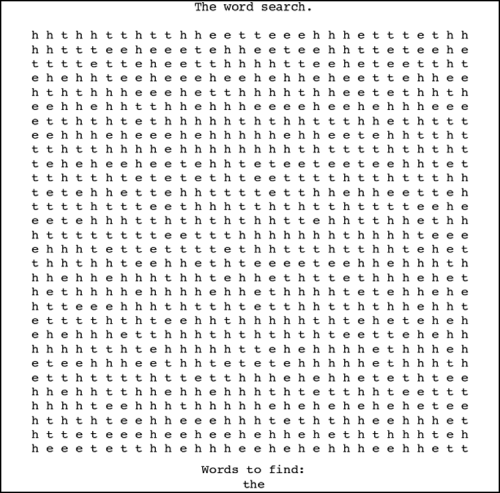 It's an absurd word search game that nobody would want to bother with, unless you want to drive yourself crazy. "The" is one of those words that we use all the time, but looks weirder the more you stare at it. Continuing with posts about time, this is one that should make us re-evaluate our time spent in this life. 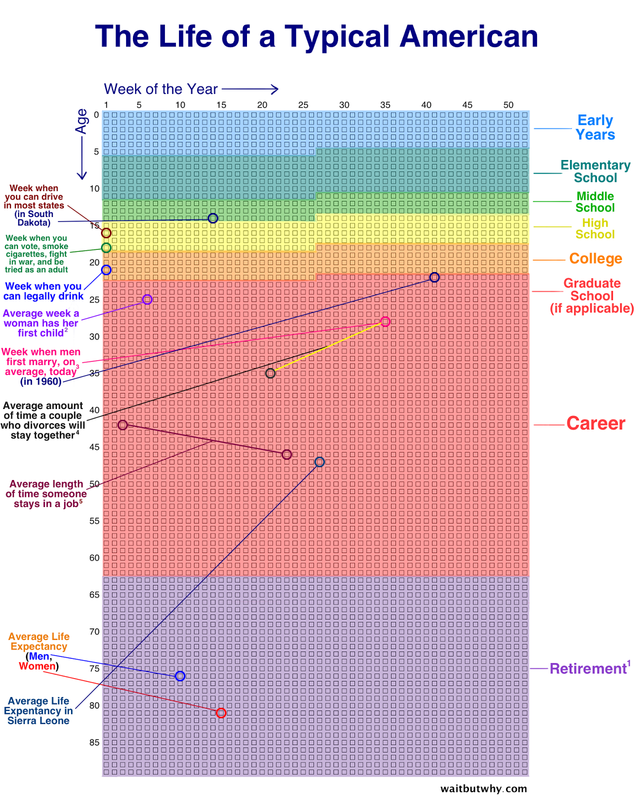 I saw this chart on Visual News that outlines the span of the modern human life in weeks, represented by single blocks. The major milestones and time periods are also highlighted. Seeing the limited nature of our mortal existence helps wake us up to the importance of treasuring each moment that we get to experience. This is not a practice run- we only get one chance to live this life. Our seconds, days, weeks, and years are counting down, right now... how are we going to make the most of it? It's the beginning of a New Year, and I'm going to continue the theme of time. I've explained previously why I think "evolution" is a loaded term that makes people believe the metamorphosis of living forms over time follows an orderly, linear progression. Despite my unease with the term "evolution", it is an undeniable fact that Life is not a static phenomenon and that living systems change. 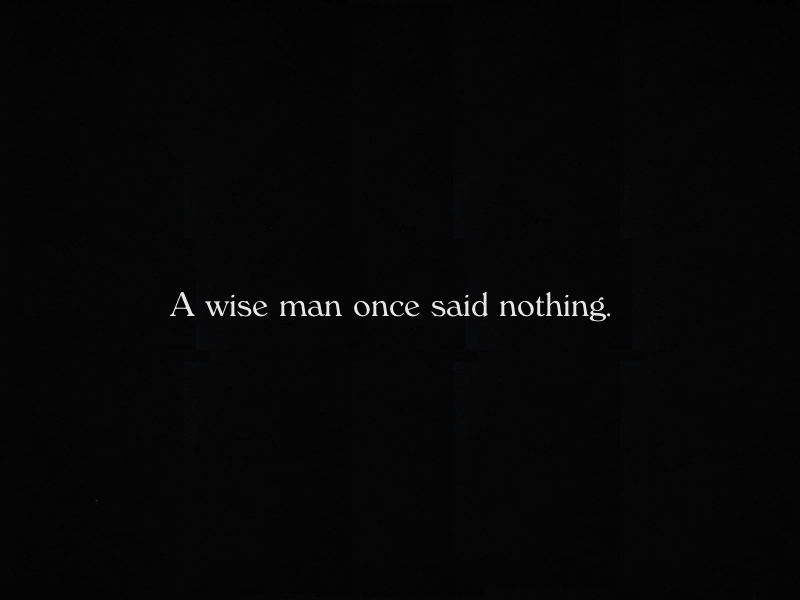 As the Greek thinker Heraclitus stated, "Nothing is permanent, except change." Changes are always happening on an individual level, down to the cellular & molecular scales. Noticeable species-wide changes may happen at different rates, though, depending on the situation. One of the intellectual benefits of digital media is the ability to visualize processes that were previously unimaginable. On Reddit, I came across this animated GIF of biological metamorphosis over the past 600 million years, which starts at cellular life and continues through up to modern humans. Originally, the order was reversed for some reason, but after some searching I found a version going forward through time. Here it is on Gfycat, allowing you to go frame-by-frame or reverse the order.